Our son will be 3 in June. His sleep is awful. He keeps getting up to go potty - sometimes he really has to go, sometimes he just says he has to go and then does the toddler talk to distract us from putting him back in bed. He is in underwear until after he brushes his teeth and says he is done going potty for the day, then he wears a nighttime diaper. I don't think the light outside is helping, either, but his sister (1 1/2) doesn't have any issues with the light and still sleeps great. So, instead of sleeping from 7:30pm-6:30am like he used to, he's sleeping from 9:30pm-5:45am. He's started having awful tantrums that go on and on during the day, and then he crashes at nap time (frequently after another long tantrum). I hate the tantrums, but I'm more concerned about his lack of sleep. It sounds like you are coming to a common parenting crossroads. Around 3 years old our children began to no longer need daily naps. You are faced with a temporary lose-lose situation. On days he naps: he is difficult to put down for his naps and even more difficult to put down at bedtime. He simply no long needs that much sleep. On days he does not nap he progressively becomes tired and irritable. In the next few months, he will regularly drop out his nap and the tantrums/fussiness will end. In the meantime, it is your call. If he seems tired and has a physically active day, try putting him down for a nap. We will often mandate “quiet time” in our home. During nap time all Gordons will head to their beds to sleep, read or simply look at books. 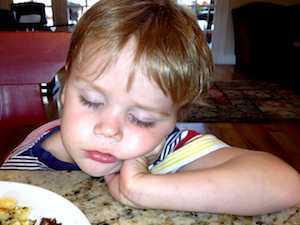 Infants, tired toddlers and parents tend to fall asleep. Our older children can get out of bed after 20 to 30 minutes of reading. Discuss with your son that his is getting older and does not always have to sleep at “nap time”. Read him a book then set him up in his bed with a couple of books and leave the light on. Let him know that if he behaves well that you will let him out of his room in 30 minutes. Some days he will fall asleep and many days he will not. Remember the days he successfully naps he will need a later bedtime. Establish a bedtime routine set in stone. Explain to your son that you will be beginning a rigid bedtime routine to address his sleep problems. Give him two opportunities to go to the bathroom during the routine. Once you have said good night and left the room he cannot be allowed to get out of bed and go to the bathroom. If you allow him to break the routine and get out of bed to go potty, then your efforts will fail. When children refuse to stay in their beds try the “two gate system” described in moving to a toddler bed.